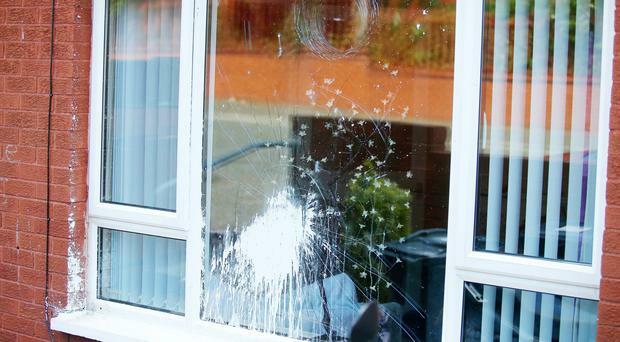 A DUP MLA has slammed a paint bomb attack on three homes in north Belfast as "utterly appalling and depraved". Commenting on the incident, William Humphrey said: "For several years interface areas in North Belfast have been relatively quiet. Those republicans who carried out this attack are seeking to end that peace. "I would appeal for calm and for condemnation of this attack from across the political spectrum. “Two young men were seen attacking these houses with paint bombs and rocks, just before midnight last night, before making off in the direction of the Oldpark Road." Mr Humphrey said he would be meeting with the PSNI along with representatives from the Lower Oldpark Community Association. Police are treating incidents of paint and objects thrown at three houses in Belfast as sectarian hate crimes. The attacks, in the Manor Street area, were all reported within a 30 minute period on Thursday morning between 12.05am and 12.35am. Inspector Robert McMurran said: “We received the first report just after midnight that two youths had hurled an object at the window of a house, before throwing paint over it and running off towards the Oldpark Road. The window was shattered in the attack. “A second report was made to us around 12.15am in which two males, wearing grey tops, threw a paint bomb at the front window of a property. "The window was not broken in the incident. “And at around 12.30am, a third report was made that front living room window had been smashed at a house in the area. No-one was at home at the time. “While no-one was hurt in any of the incidents, the residents were left shocked by what happened. "We are treating all three as sectarian hate crimes. The incident comes just over a week after loyalist paramilitaries forced a grieving mother, whose son died only days before, out of her home in the Oldpark Road area. It is believed the UFF threatened the woman and ordered her to leave her home. Hours later her home was attacked and the windows smashed. By Mark Edwards A Sinn Fein Mayor has been accused of "abusing her position" after holding an event to commemorate the 1916 Easter Rising on council property. Two men arrested in connection with dissident republican activity have been released unconditionally. Ulster University spent £226k on settlements to staff that included "gagging clauses" in the past two years, it has been revealed. One person has been taken to hospital after a serious road crash in Strabane.